VETS have warned pet-owners in South Cumbria to be vigilant after two dogs suffered snake bites within the space of 10 days. Oakhill Veterinary Group in Windermere issued the appeal on Facebook this morning, asking people to be particularly careful in areas of long grass, bracken and woodland. 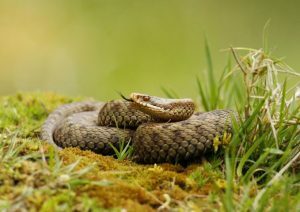 One of the two recent adder bites treated by the practice was picked up in the Langdale area, the other around Ambleside. Earlier this month, the Evening Mail ran an advice article about adders where Cumbria Wildlife Trust explained how the snakes come out at certain times of the year to prepare for mating and hunting. The animals are thought to pose little danger to humans. “1) Call us immediately. We will arrange to meet you at the Windermere practice where we can use anti venom to treat your dog. “2) If possible, carry your dog back to the car. This will help reduce the venom spreading around the body.